2. Stir until all is evenly distributed and all is completely melted. 3. Measure out Crispix into a large bowl. 4. Pour chocolate mixture over Crispix and fold until all the cereal is completely covered. 5. 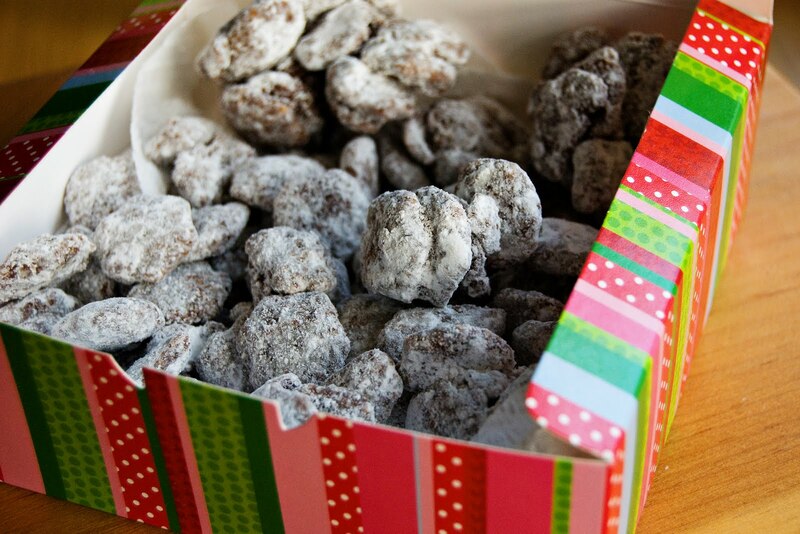 Put powdered sugar into large paper bag. 6. Put Crispix into the bag with the sugar and shake until all the cereal is covered. 7. Add more sugar as needed. 8. Lay cereal on wax paper until cool. 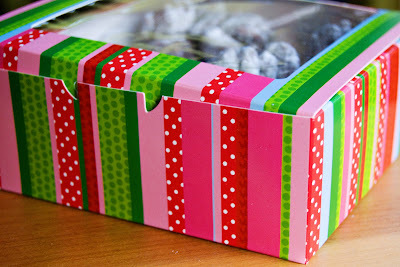 Get these adorable treat boxes at Hobby Lobby - they've gone on sale already, so 10 only cost $3! That is a whole lotta cute for not a lotta money, my friends! I plan on squirreling away some of these babies to use through the year. I like to refrigerate my puppy chow. I also place it in baggies before packaging so the powdered sugar doesn't go everywhere it's not supposed to. This was the perfect favor for my daughter's birthday party which had a doggy theme to it. I think it would make an excellent holiday treat...however, you may want to rename it to "Chocolate-Peanut Butter Crunch" so people don't think you're insulting them. 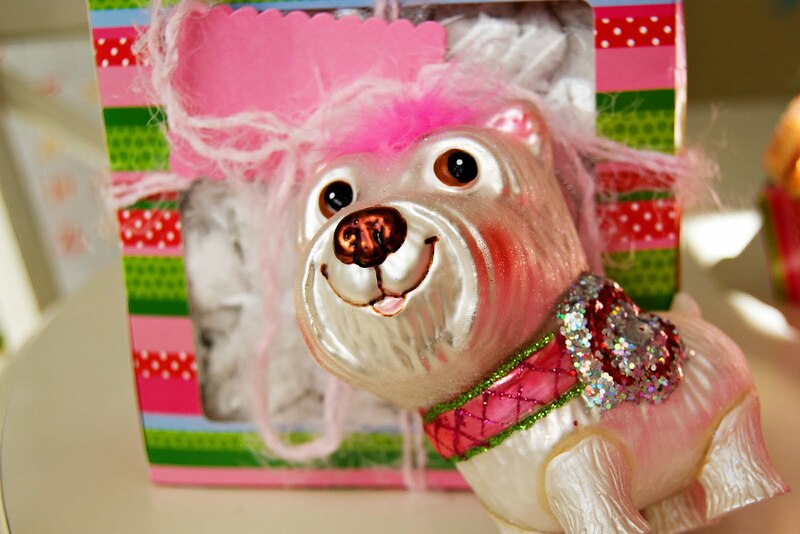 You can even top it off with an ornament. Thanks for visiting and happy snackin'! That looks easy and yummy. Love those cute boxes! I will have to pick some up! Nom nom nom... I will make you and eat you all year round, puppy chow... T, I was so disappointed when Cole (cough, cough) finished it off! He could not figure out where/when so much of it had gone! This does look easy enough for me... :) and I def. want to do puppy party for the girls. Thx! Nice! These would make a wonderful holiday treat. Thank you for sharing. I will look forward to making this treat for Christmas. It looks delicious! But I think i'll find it hard to stick to my "Just One" Christmas plan...or course the cook will have to sample as she packages...right? Merry Christmas and thanks for your kind comments through the year. me...i'm more of a dark chocolate kind of gal. but it would be good to have the recipe.